A hefty combination of 20 Gurkha Cigars Kitchen Sink Collection different premium handmades. 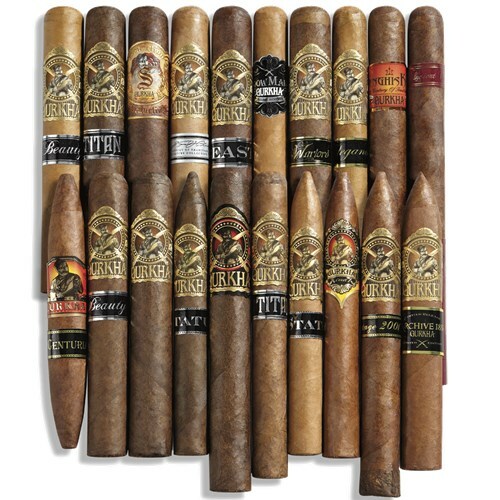 A hefty combination of 20 Gurkha Cigars Kitchen Sink Collection different premium handmades – from Beauty to Warlord and everything in-between – deep-fried in superior 80% savings, and drizzled with a sizzling $3.49 per-cigar sauce. An epic deal only Garcia Cigars can deliver, and I suggest you take advantage, stat. In 1887, at the height of the British rule, colonial soldiers began to make their own cigars from the local tobacco. Behold, the Gurkha Cigars Kitchen Sink Collection, a massive, 20-cigar collection of Gurkha’s finest ultra-premiums.